Passover begins this coming Monday evening, March 29th. Many of you may remember that I appeared on Great Day St. Louis last year at this time. I demonstrated how to make both an Easter and Passover recipe. If you missed it I’ve attached the link to the video clip plus the recipe for my Salmon Roulade below, which can be made for both holidays. I mean who says you have to have the traditional brisket for Passover or the traditional lamb for Easter? Why not have something light, healthy and refreshing this year? 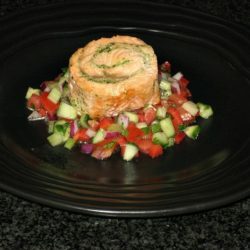 Try my Salmon Roulade. I think it’s wonderful! Next week I’ll post my Easter Bunny Cupcake recipe and video. To view the Salmon Roulade click on the video. Gazpacho Salsa: Combine all ingredients together and refrigerate until ready to use. The salsa will keep for approx. 4 days. Cilantro Pesto: Combine ingredients in food processor and set aside until ready to spread on the butterflied salmon. Place the salmon on a cutting board and carefully butterfly it. Starting at one of the long sides, make a horizontal cut with a sharp knife, and continue to cut within an inch of the opposite side--keep top and bottom layers as even in thickness as you can, being sure not to cut completely through the flesh at the end. Open the salmon like a book and cover the surface with a piece of plastic wrap. Pound evenly but firmly with a mallet, all over the surface to a thickness of about ¼ inch. Remove plastic wrap. Place a piece of parchment on the counter and lay the pounded salmon on it (short edge) closest to you and the top edge of the parchment paper. With a spatula spread the pesto over that side of the salmon facing you leaving about a ½ inch border along both ends. To start the roulade, fold over the edge closest to you making a roll and continue rolling from that side until rolled up like a cigar. It’s like making a jelly roll cake or sushi. (You can use the parchment paper as an aid in rolling up the fish, just as you would a bamboo mat to make sushi. Be careful not to roll any of it in with the fish.) Your roll should be in the mid-range of tightness. It cannot be too tight, as it will expand as it cooks, and it cannot be too loose, or it will fall apart. To finish, take completed roll and remove from parchment paper and place on top of a piece of heavy duty foil. The foil must be wider and longer than the salmon roulade. With the shiny side of the foil in, roll the roulade tightly in the foil. Twist ends to secure. Chill for at least 1 hour or up to 24 hours to firm the roll. When you are ready to serve, preheat the oven to 500 degrees. With a sharp knife cut the ends off the roulade where it’s been twisted with the foil. Then with a sharp knife cut the roulade through the foil in ½ and then ½ again giving you 4 equal pieces. Each section will be approximately 2 inches thick. Do not remove the foil. With foil left on place individual roulades on a foil lined baking sheet in the oven standing upright with pieces close to each other as they were in the entire roll. Bake for approximately 10-15 minutes depending on if your oven is convection (10 minutes) or conventional (15 minutes). 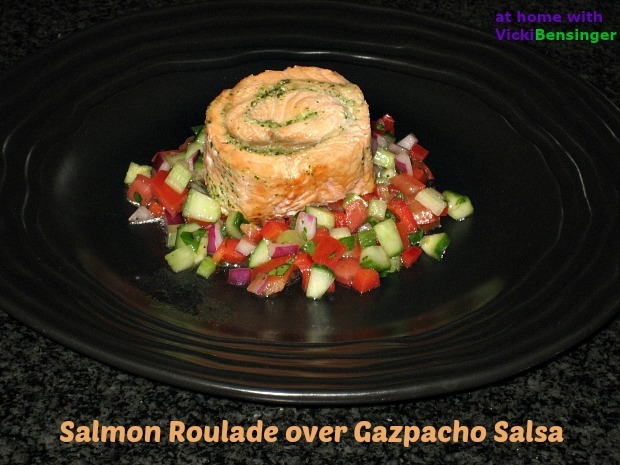 To Serve: Place a large ladle of the Gazpacho Salsa on the center of a plate and set the Salmon Roulade on top. Remove the foil wrapping from around the roulade and serve.